Seasonal Allergies are a Symptom, they are NOT the problem. Ahhh! Sneezing, runny nose, sinus congestion, fatigue; symptoms of seasonal allergies- or not so seasonal for some people. If you're reading this, you probably know them well. It's hard for anyone who doesn't get allergies to understand how miserable they can make you and how much they can affect your life. 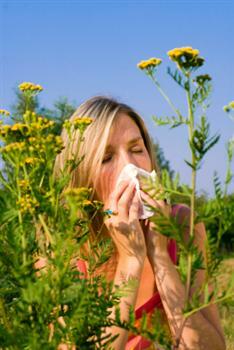 Allergies are the immune system's response to 'allergy triggers'; things like pet dander, pollen or mold. Atopic Dermatitis (exzema), seasonal allergies and Chronic Asthma are all in a class of illnesses called Allergic Disease or Atopic Disease. What all of these allergic diseases have in common is the genetic predisposition to have an abnormal and hyper reactive immune system response to these common allergy triggers. Yes, I said ABNORMAL response! So many people have seasonal allergies, over 50 million people in the US alone, and it is so common to see people sniffling and sneezing during the spring that we think of allergies as being 'normal'. Just because something is very common does not make it normal. Allergies are caused by the body taking in an allergy trigger. Pet dander, pollen, mold or an Environmental Toxin among others. These seasonal allergy triggers come into the body and the immune system is triggered, just as it would be for any foreign substance that enters the body. The immune systems of people who do NOT have allergic disease see these substances and eliminate them. This is no different than the way we react to thousands of other substances that we come into contact with every day. But the immune systems of people WITH allergic disease see these substances and mount an emergency response. This emergency response consists of a specific type of antibody, called Immunoglobulin E or IgE, being activated. These IgE antibodies act very powerfully and can cause VERY severe reactions, even death in the face of just a tiny amount of an allergy trigger. This powerful response sets off a cascade of inflammation that causes your miserable symptoms. What allergy treatments are there? •	Immunotherapy - commonly called 'allergy shots' but which are also administered under the tongue- for the (generally) multiple allergy triggers. These can take months to years of treatment to be effective, if they are at all. •	Avoidance of the common allergy triggers which are often difficult or impossible to avoid. These treatments usually work temporarily, but symptoms tend to return so that most people tend to have an ongoing chronic problem. Lets face it, if these treatments worked, the US would not spend over 3.5 BILLION dollars annually for this ONE problem! The reason that these seasonal allergy treatments don't work is that they never address the question of why the immune system is hyper reactive in the first place. It never addresses the source of the problem. These treatments don't work because this hyper reaction is really just a SYMPTOM. Allergic diseases are not truly diseases in and of themselves, but symptoms of underlying imbalance in the body. Most western medicine practitioners would disagree with this statement and we can debate about clinical trials or evidence that proves one or the other of these theories as being right. But having this viewpoint allows us to stop looking at seasonal allergies as a chronic illness, and start looking at it as communication from the body telling us that something is out of balance. This allows us to fix what is out of balance and solve the problem, rather than simply suppress allergy symptoms. But aren't seasonal allergies genetic? Yes, more people who get allergic disease have family members who have them. Studies do show genetic components to these diseases and scientists are looking at multiple genes as being the culprit in these diseases. But it is not an inherent genetic defect that causes these problems. Genetics INFLUENCES whether you have allergic disease and how severe it is, but genetics do not CAUSE them - environmental factors cause the EXPRESSION of these genes. Not EVERYONE who has these genes will get the disease. Environmental factors cause the body to get out of balance which leads the genes to express the illness. Genes are not the problem. In one sentence, the immune system is the problem. The immune system is designed to differentiate that which will hurt you from that which won't - and destroy that which will. That is really its ONLY job. Healthy immune systems do not go into emergency mode over pet dander and pollen. But unhealthy immune systems do - especially when they have the genetic tendency to do so. And since environment influences the health of your immune system, and the immune system tells genes to express these illnesses, an improved environment can keep your genes from expressing allergic disease as well. So, it's a variety of environmental factors, not JUST allergy triggers, that cause your allergy symptoms. Unfortunately, there are many factors that interact to contribute to your illness. Fortunately, small changes in any one of these factors can make a big difference. Just as a pebble dropped into a pond causes ripples to cover the entire surface, so even small changes can ripple benefits throughout your whole body. Seasonal Allergies can be a thing of the past by taking action and making changes in your lifestyle is one of the most important things that you can do for your health. You might be surprised at what some minor changes can do for your chronic asthma symptoms.